The weekend workshops are now offered over two days. You can sign up for one day or for both days, at your choice. We will visit entirely different locations on both days so if you attend both days you will not photograph the same places twice. Both days are as exciting locations-wise, and there is not one day that is better than the other. The decision to offer two day weekend workshop was made to help you maximize the use of your time if you are travelling from a long ways or want to enjoy an extended weekend of photography in the field. Day 2: Sedona Rock Art (petroglyphs) and Red Rock Crossing. A print review will be conducted during the workshop. 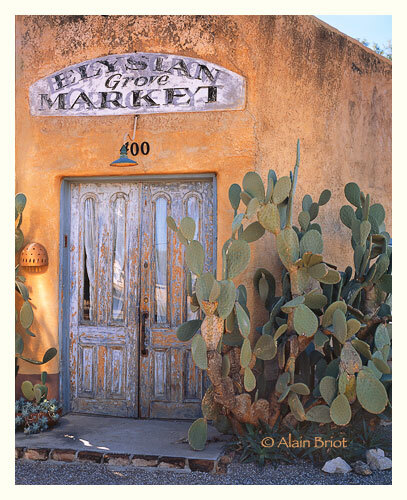 Bring 6 photographs of your work, 8x10 print size or larger. 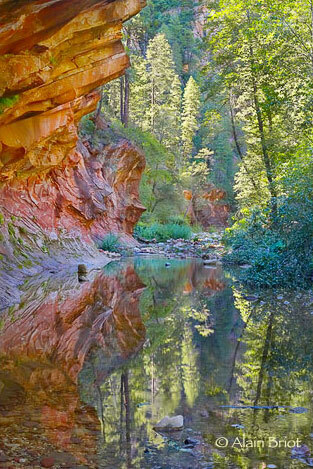 The landscape of Sedona is world famous and for good reasons. It embodies the spirit of the Southwest, the red rocks, the majestic canyons and rock formations, the lush vegetation, and the rock art, petroglyphs and pictographs, left behind by previous Native American cultures. 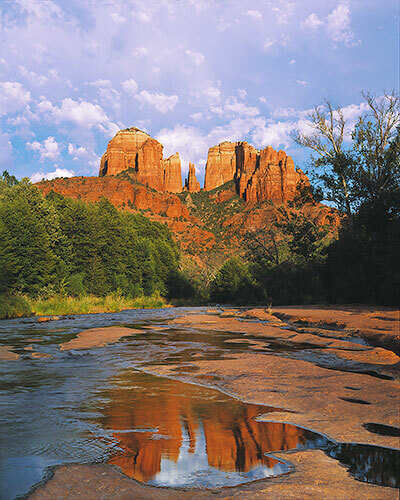 During this workshop we will explore the variety of landscapes offered by Sedona, by taking you to widely different locations, each chosen for its superlative photogenic qualities. We will photograph sunset on both days, each time from a different location. We will study light and texture throughout the workshop, focusing our study on the different types of natural lights available to us, and learning how to use each of them to perfection. We will also study composition, focusing on learning how to use leading lines, rhythm, and how to create balanced compositions. 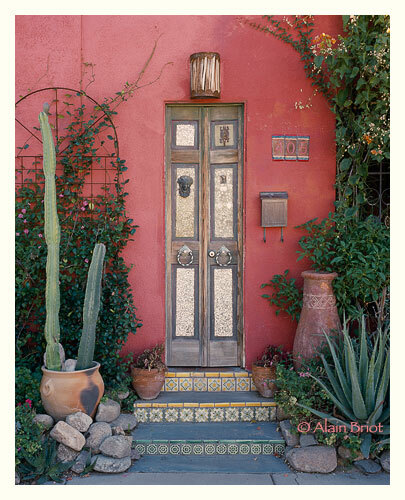 This workshop will take you to the most exciting areas in Tucson and vicinity. Saturday will focus on the Barrio Historico, an area of colorful historical homes and Spanish era architecture. We will study the use of color in photography, have lunch at the oldest restaurant in Arizona, and conduct a print review in the field prior to concluding the day with Sunset at Saguaro National Park, West Unit. On Sunday we will continue our photographic journey with an exploration of Sabino Canyon, one of Tucson's most closely guarded natural "secret" and a photographic paradise. We will have lunch in the field and will conduct a print review for participants attending the Sunday workshop only. 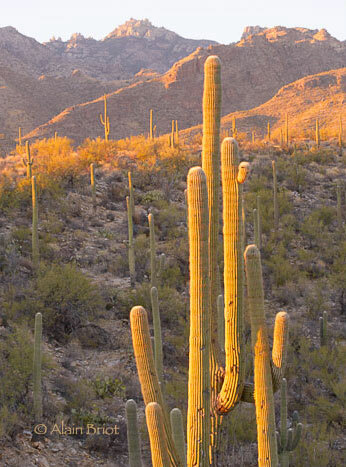 Sunset will be in Sabino Canyon or in Saguaro National Park, depending on participants preferences and on our schedule. $295 per day $499 for both days. You can register by calling us toll free at 800-949-7983. We can take your registration and credit card information over the phone. If you prefer to register by email, or by mail, click here to download a emailable pdf Workshop Registration form . Fill in your information on this form and simply mail it or email it back (24 hours a day) to us. Do you need additional information? No problem. Simply email us at alain@beautiful-landscape.com or call us at 800-949-7983 or 928-252-2466 . We will answer your questions by email or over the phone and help you with any subject concerning our workshops. - Bring clothing suited for a variety of temperatures, from cold mornings to warm afternoons. Also be prepared for potential rain and for active weather. To quote David Muench: "bad weather equals good photographs." - Food, lodging and transportation are not included. Some of you may want to camp, some stay in a hotel, some may want to eat with the group while other may prefer to be on their own. This arrangement provides for maximum flexibility while keeping the cost of this workshop to a minimum. It will gives you maximum freedom in planning your meals and give you time by yourself if you choose. - We will email you directions to our meeting place and a detailed workshop schedule approximately 2 weeks before the workshop. - We will be photographing from 2000 to 5000 feet elevation on average. Normally the only problem you can expect is a slight shortness of breath. However the higher elevation is something to keep in mind if you live at sea level or you are prone to encountering physical difficulties at higher elevations. - A passenger car is suitable for this workshop since we will not drive on 4 wheel drive roads during the workshop. However, if you rent a car, we recommend you rent an SUV as it is more suited to this kind of activity. -We have a no tag-along policy. Spouses, friends, significant others and non-photographers need to be registered as full-time participants to join any aspect of this workshop. This includes meetings, print reviews, lectures, meals and all other aspects of this workshop. No exceptions. For further details read our Workshop FAQ. - We do not carry cell phones. We will use walkie-talkies to communicate with each other during the workshop, when we are on location and when we are driving. If you become separated from the group we will call you on your walkie-talkie to find out where you are (provided you are within a 2 or 3 mile range). For these reasons we ask that you bring a walkie-talkie, such as a Motorola Talkabout or equivalent, to the workshop. Please set your walkie-talkie to channel 4-5. A print review will be conducted on Sunday, the second day of the workshop. Make sure to bring 4 to 10 prints of your work, 8" x 10" or above print size, to share with the group. Our print reviews are designed to be friendly and helpful. They offer an opportunity to present your work, ask questions, and receive answers and feedback from both the group and the instructors. Guidelines will be provided to you during the workshop print review. We will be helping you and photographing with you from sunrise to sunset, with a break for breakfast and lunch, during the entire duration of the workshop. All monies are non-refundable. If you cancel participation in this workshop your registration fees may be transferred towards registration in another Beaux Arts Photography workshop under certain conditions. 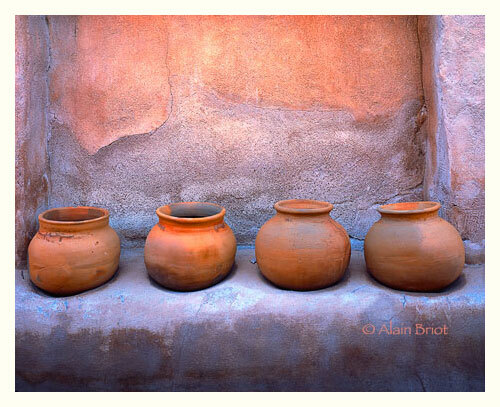 Transfer of fees to another workshop is not automatic and is decided solely by Beaux Arts Photography as a courtesy. We reserve the right to decide whether to transfer your fees to another workshop or not. You must register for another workshop within one year from the starting date of the workshop you originally registered for. Participants transferring from another workshop will be registered for this other workshop in excess of the regular number of participants. If you decide to attend a higher priced workshop the difference in cost between the two workshops will be charged to your credit card when you notify us that you want to sign up for this other workshop. Your registration is guaranteed only when we have payment in full. If this workshop is cancelled by us you will receive a full refund. 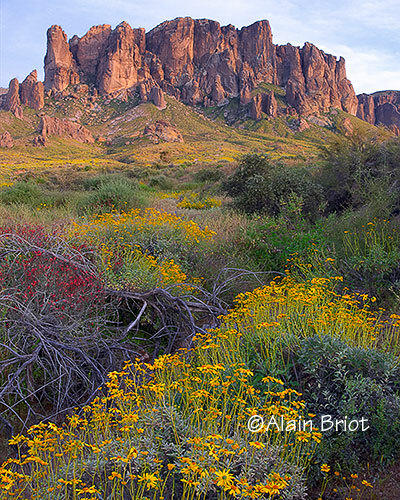 Beaux Arts Photography, Beautiful-Landscape.com, Alain Briot, Natalie Briot, guides, and cooperating agents aim to provide every participant a safe, educational, and enjoyable experience. We act solely as agents for you regarding accommodations, special activities, and travel, by any means, and assume no liability for any act, error, omission, injury, loss, delay, mishap, or damage to persons or property arising from any cause during the course of the workshop or in transit thereto. We can accept no responsibility for losses or additional expenses due to delay or changes in the services to be provided. We reserve the right to change our arrangements should conditions necessitate, or to cancel any aspect of the workshop due to exceptional circumstances. In the event that we deem it necessary to cancel the workshop we will provide a full refund which the participant(s) acknowledges as full and final settlement. In the event of a workshop cancellation airline tickets, car rentals and hotel reservations associated with participation in this workshop will not be refunded. We recommend you purchase refundable airline tickets and make refundable car and hotel reservations. We also recommend you carry travel and camera equipment insurance. As there is always an element of risk in any adventure associated with the outdoors, participants must read this form carefully. This liability release will certify that the participant is physically fit and capable of participating in outdoor photography exercises in field locations, and is fully and completely aware of any associated risks created by field locations and weather. Meeting times, meeting places and itinerary are subject to changes dictated by the weather, the road conditions and other imponderable variables that are part of doing landscape photography. We do not carry cell phones. You are responsible for being at the meeting place at the designated time and have your photographic equipment with you. By joining this workshop I acknowledge that I have read the above information concerning responsibility and release Beaux Arts Photography, Alain Briot, Natalie Briot, their guides, instructors and any cooperating agents from any liability. Beaux Arts Photography, Alain Briot and Natalie Briot will assume no liability for injury, illness, or loss of personal property or expenses thereof associated with workshop participation. I also acknowledge that Alain and Natalie Briot have the right to refuse service to anyone at anytime and that workshop policies are subject to change at any time.